Every year, we get the official Santa trackers from Google and Microsoft to keep track of where presents are being delivered. 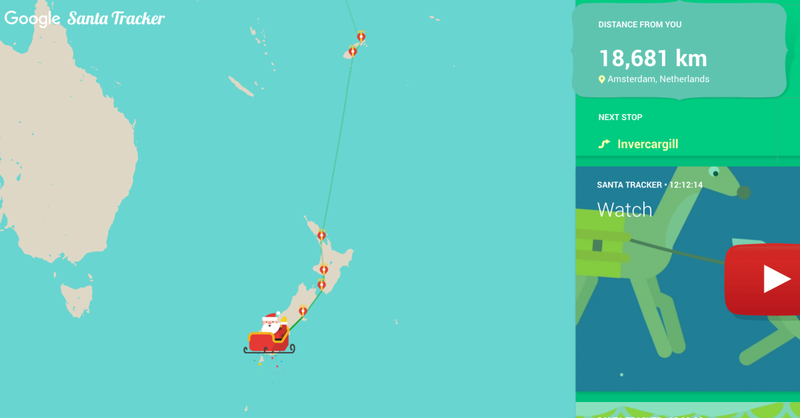 This year’s no different, and Google today fired up its Santa tracker, kicking off with Wellington, New Zealand, which has already started Christmas. If you search ‘santa tracker’ you’ll also see where Santa is right now in your search results, and it’s adorably designed. Google’s tracker shows Santa’s distance from you, how many presents he’s delivered and where he’s headed next in real time, so you can get the very latest on deliveries. NORAD’s Santa Tracker, however, shows that he’s currently over Russia and has delivered hundreds of millions of presents already. It’s more of a 3D interactive experience so you can follow Santa along, rather than Google’s illustrated, top down style. It’s hard to know which tracker is accurate, since Santa is so elusive, so you’ll need to choose the one you prefer. The idea of a Santa Tracker came about because of a mistake in a newspaper advertisement sixty years ago that accidentally published a top-secret NORAD number, which connected directly to the military group’s Director of Operations.